This is one of over 30 illustrated articles in the author’s Astronomy Digest. 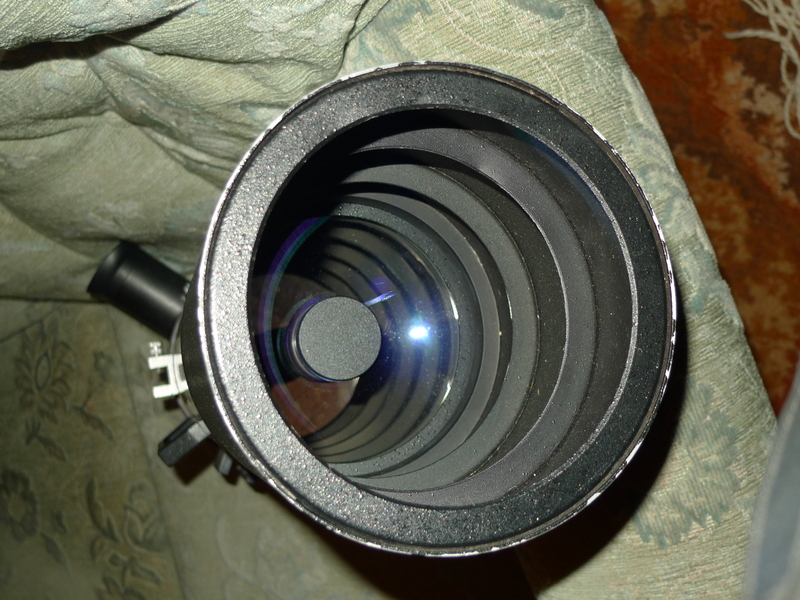 Catadioptric telescopes − which use both mirrors and lenses to produce an image − are now very popular with amateur astronomers as, for a given aperture, they are far more compact than a Newtonian. One such type is the Schmidt-Cassegrain which uses a spherical mirror allied to a thin corrector plate mounted at the outer end of the tube assembly. In 1941, the Russian optician, Dmitri Maksutov produced an alternative design which, instead of a thin corrector plate having a complex surface, uses a thicker dished meniscus lens using simpler spherical surfaces. One advantage is that the design is that it corrects for what is called ‘coma’; stars towards the edge of the field of view tending to look like little comets. 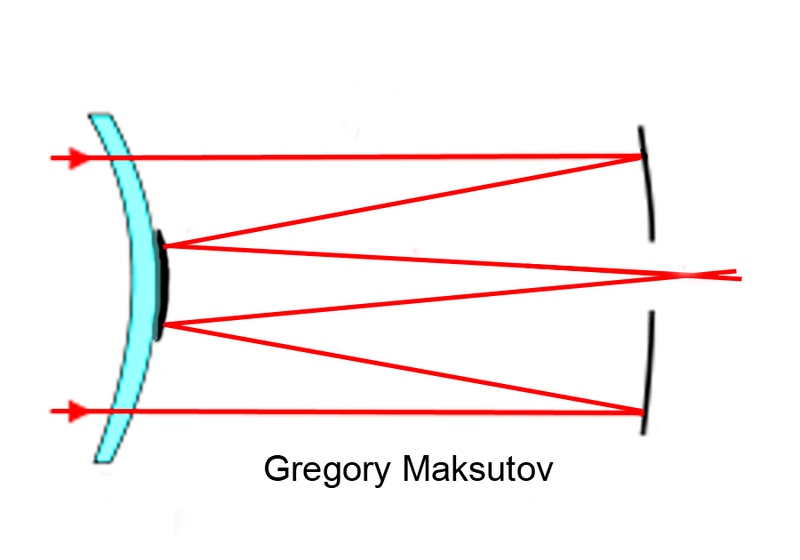 In the majority of amateur Maksutovs (called Gregory Maksutovs), the secondary mirror is simply an aluminised (or multi-coated) circular spot on the interior of the corrector plate as shown in the figure below. This means that its radius of curvature must equal that of the corrector plate – which somewhat reduces the ‘degrees of freedom’ of the optical designer but is, of course, very cost effective. 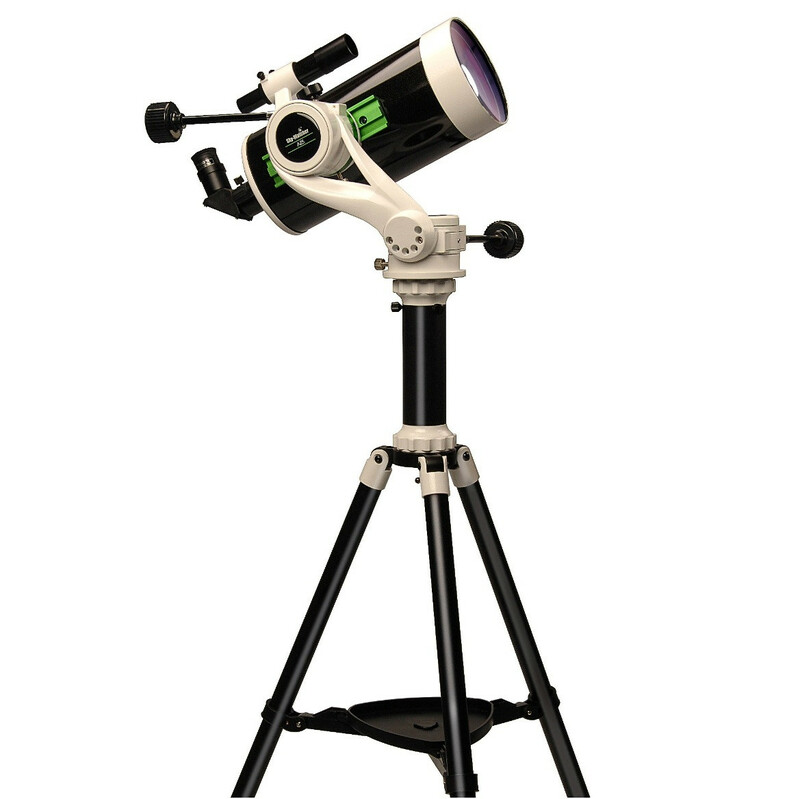 SkyWatcher make Gregory Maksutovs in four sizes; 90 mm, 127 mm, 150 mm and 180 mm. The 90 mm version at about £129 for the tube assembly is often used as a spotting scope for birdwatchers. It can be bought on an EQ1 equatorial mount from WEX photographic for ~£169. The 102 mm version can be bought as an optical tube assembly for ~£129, mounted on a manual SkyWatcher Alt/Az mount for ~£265 (quite nice). It can also be bought mounted on a computerized Alt/Az mount for ~£378. The 127 mm size can be bought either as a tube assembly alone for ~£254, mounted on a manually controlled SkyWatcher Alt/Az mount (the Skymax 127 AZ5) for £435, with a non computerised, but tracking mount (the Skymax-127 SupaTrak) for ~£360 or with a computerised mount (the Skymax-127 AZ Synscan Go-To) for ~£399. The latter is a better buy I believe. There is even a new Alt/Az version, the Skymax 127 AZ-GTI which is controlled by WiFi from a smartphone or tablet using the supplied App. It costs ~£485. Impressive. Their 150 mm Maksutov can be bought as an optical tube assembly for ~£525 and on an EQ5 equatorial mount for ~£849. 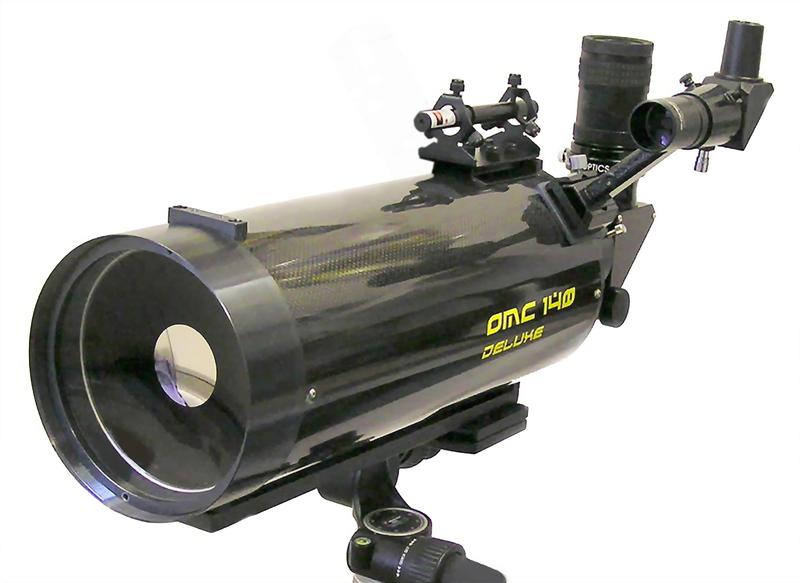 The SkyWatcher 180 mm Maksutov can be bought as an optical tube assembly for ~£775 and on an EQ6 equatorial mount for ~£1,999. With a focal ration of f/15 and focal length of 2,700 mm its field of view will be small but it will make a superb planetary scope. 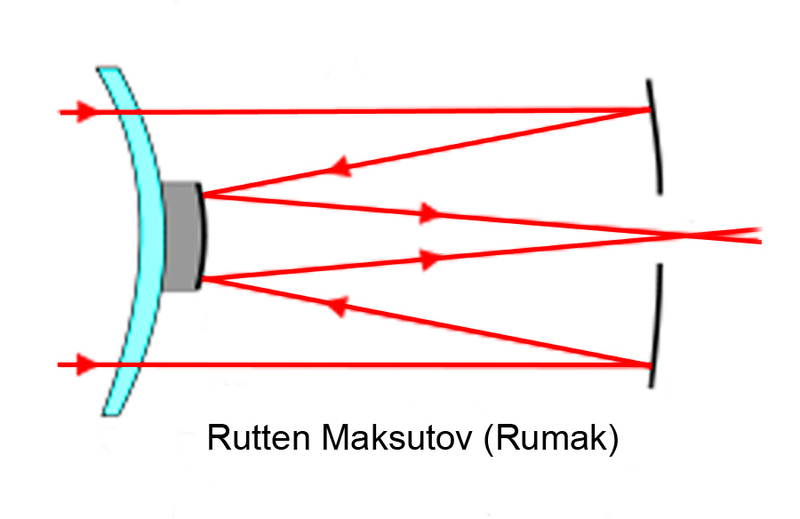 The Rumak Maksutov is named after Harry Rutton who incorporated a separate secondary mirror into the Maksutov design as shown in Figure below. This obviously increases the cost but gives the optical designer a further degree of freedom so enabling him to enhance the performance of the telescope. He could, for example, give it a shorter focal length than an equivalent Gregory Maksutov so enabling a wider field of view with similar image quality. Or, if he keeps the same focal length, he could improve the image quality by providing a flatter field (important for CCD imaging) and so giving high quality star images. He will probably produce a design with a somewhat shorter focal length than the equivalent Gregory Maksutov but still be able to improve on the overall image quality − which is generally regarded as being a touch better than standard Schmidt-Cassegrains. In the past, the majority of Rutten Maksutovs have been made in Russia by Intes Micro who produce them with apertures from 5 inches upwards. For some years now the author has been the owner of the 5 inch (127 mm) version called the ALTER M500. With an excellent, internally baffled, metal dew tube this currently costs £766 (available from the Widescreen Centre) and is beautifully made with knife edge baffles along the interior of the tube assembly whilst using very high quality mirrors having 95% reflectivity. Its focal length is 1270 mm giving it a focal ratio of f10. The 6” (152mm) size can be bought with either f10 or f15 focal lengths − the latter designed especially for planetary and lunar imaging − and costs about £1286. In the United Kingdom, Orion Optics of Crew collaborated with Harry Rutten to design a range of Maksutov Telescopes. Their f14, OMC140 version now has a carbon fibre tube and comes in two versions with standard (1/4 wave) optics and standard mirror coatings for ~£667 or, in the de-luxe version, with 1/6th wave optics and high reflectivity coatings for ~£912. A Metal Dew shield is available for a further £60. 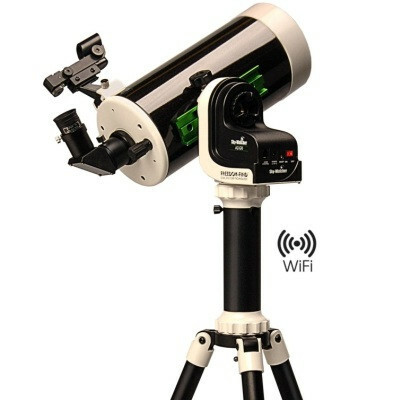 This is a superb planetary and lunar scope but can still be used for deep sky observations. Recently, Altair Astro has begun to import a Chinese made 150 mm f12 Rumak Maksutov which costs £750 pounds. All optical surfaces have high reflectivity multi-coated surfaces and it comes with a high quality 8×50 finder scope. The optics of the sample that the author has reviewed were excellent, giving pin sharp images across the ~1.4 degree wide field of view provided by a 2 inch 40mm eyepiece. 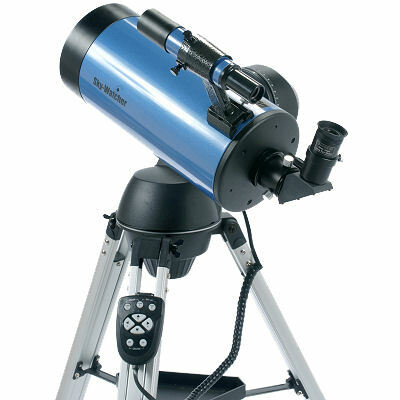 Let’s consider the advantages and disadvantages of buying a 5 or 6 inch Maksutov as compared to a Schmidt-Cassegrain. A 6 inch S-C will be some what cheaper, smaller and lighter but I suspect that the image quality will be somewhat better in the case of the Rumaks and, in particular, will give somewhat more contrasty planetary images. How do they compare with other optical designs at this aperture size range? The ultimate in image quality would come from using an apochromat refractor. Their cost would be considerably greater and might need a field flattener to provide pin sharp images to the edge of the field if used for CCD imaging. Next in the optical stakes are the Maksutov-Newtonians. They rival apochromat refractors in image quality but are somewhat heavy and unwieldy needing bigger (and hence more expensive) mounts to carry them. 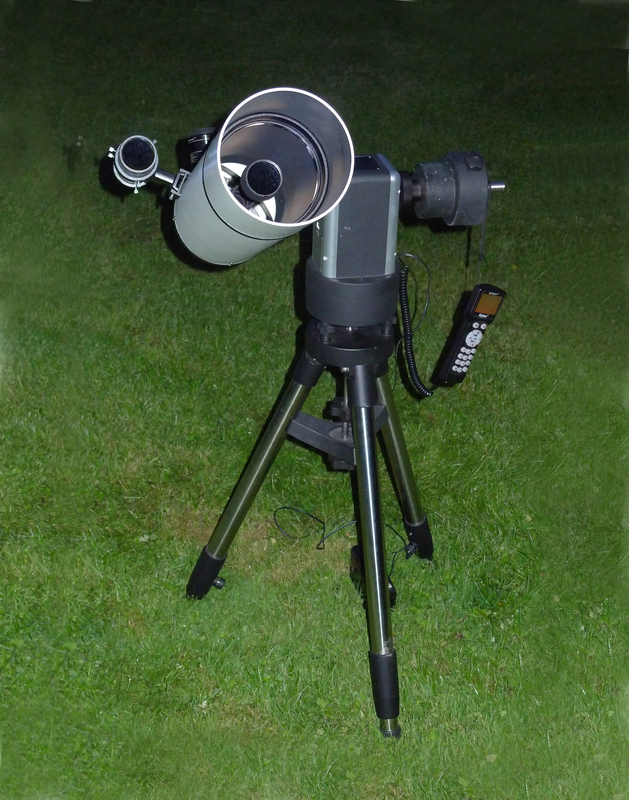 The author has an Intes-Micro 150 mm version which has superb image quality giving somewhat brighter images that his exquisite 102 mm Takahashi apo refractor but, due to its size, it doesn’t get used as much as it ought to. Newtonians can give superb images near the centre of the field of view but, due to coma, this will drop off towards the edge unless a ‘coma corrector’ is used . Taking cost, practicality and performance into account a Rumak Maksutov could well be the optimum choice – particularly if you want a ‘get up and go’ telescope to take away from the lights of your town into darker skies. What can one see with a telescope of this aperture? Well the first thing to note is that all the objects in the Messier Catalogue − which includes many galaxies − were observed with a telescope having an aperture of ~90mm. 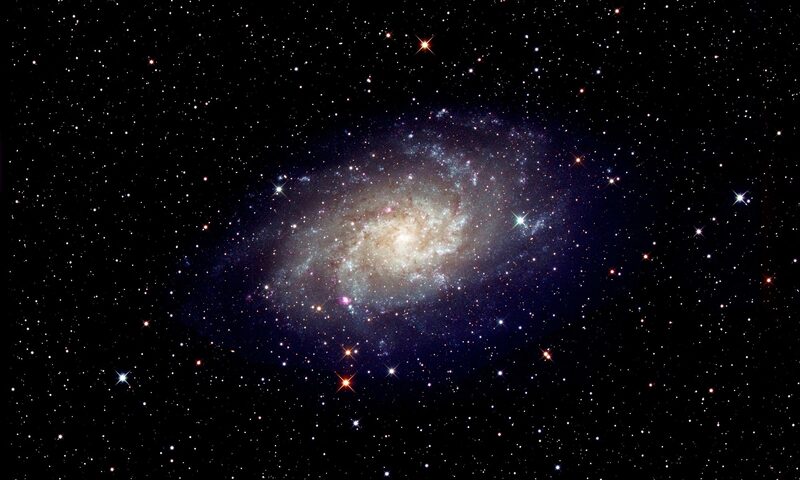 But then, Charles Messier lived at a time when it was dark at night! The thing that has really come home to the author in the last year is that it is the sky conditions rather than the size of telescope that really matters when observing ‘faint fuzzies’ as distant galaxies are called. The point is this. As they are extended objects, they will have certain brightness say, per square arc minute. If the sky brightness per square arc minute is greater than this you will not be able to see them no matter how big your scope. In complete contrast to my home location, when observing from a very dark site in mid Wales it is surprising what can be seen with a scope of this aperture: M27, the Dumbell Nebulae, was seen as a diffuse ball of cotton wool against a pitch black background, the Ring Nebula, M57, appeared as a well defined smoke ring and the Andomeda Galaxy, M31 showed up beautifully. What was immediately apparent in the eyepiece was its accompanying galaxy, M 110, that I can barely see that from home. Observing the pair of galaxies, M81 and M82, in Ursa Major showed that M81 had a distinctly brighter centre within its outer spiral arms, visible but not showing structure and M82 was obviously ‘cigar’ shaped. What has really impressed me recently was how much one can see with a relatively small telescope given a really dark sky site. So, one final point: due to their relatively long focal lengths, Maksutov’s are often regarded as being only suitable for lunar and planetary observing. I believe that they can be pretty good for deep sky observing too. What more can one want?